The first day of the 2014 World Cup is behind us. Let's recap today's action. Brazil started the game well, until the 11th minute mark that is. Olic sent a cross into the box and Marcelo put through an own goal. He was caught in no man's land and while trying to clear the ball he just tapped it in. That was the first time Croatia made it to the Brazilian penalty area and they were ahead. You could feel the pressure was on for Brazil, but Neymar and Oscar took the team on their shoulders and pushed forward. However, Brazil's defensive line was looking shaky every time they would lose possession. The rest of the first half was all Brazil and at the 22nd minute mark a curling shot from Oscar was just kept out by Pletikosa, who made an incredible save. It was no surprise that Oscar and Neymar where at it again in the 29th minute. Winning the ball in midfield, Oscar passed up to Neymar that with a weak, but well placed, shot made it 1-1 for Brazil in the 29th minute. Brazil continued to press and most of their attacks came from their right hand side with Dani Alves playing more like a right winger than a right back. Oscar and Neymar continued to dominate the play, as Brazil took complete control and put increasing pressure on the Croatian back line. The scoreline at halftime was 1-1 and I would dare to say that it was flattering to Croatia for how little they had done. The second half started in a very different way from the first 45 minutes. Croatia was defending higher up the field, putting pressure in the Brazilian defensive zone, and creating problems in midfield. Oscar, who had been so important in the first half, was having a hard time getting the ball and making the first pass. Both teams looked like they could score a goal. The balance of play was largely equal until referee Yuichi Nishimura, from Japan, blew his whistle and pointed to the spot after Fred was judged to have been brought down in the box. For a guy the size of Fred, he went down fast and quick. A very soft penalty call that I expect Brazil to get in many of their games, as most hosting countries seem to get them during these tournaments. Neymar was called to convert and Pletikosa almost stopped him. He was able to get his fingers on it but it was too powerful and Brazil was up 2-1 at the 70th minute mark. Croatia seemed awoken by this goal and went forward looking for the equalizer, while Brazil moved their midfield and defensive lines back and started to defend close to Julio Cesar. The back four for Brazil were not at their best, every time Croatia would push forward either by Rakitic or Modric, Brazil was having a very difficult time clearing the lines and moving forward with the ball controlled. In the span of five minutes Julie Cesar has two huge saves that allows Brazil to stay ahead in the scoreline, and when it looked like Croatia still had enough gas to score a second goal in the last 4 minutes, here comes Oscar with a toe finish that put the result in 3-1. Oscar's goal was well deserved for the best player on the field for Brazil. His finish remind me of Romario in 1994. A great finish from the young Brazilian. The game was over, Brazil knew and Croatia knew, a few minutes later and the ref made it official. The final score was 3-1 for Brazil. Brazil was impressive in this match. 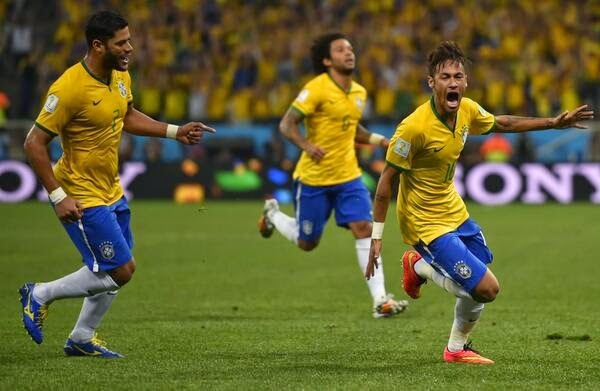 I know the scoreline suggest otherwise but it was a very shaky game from Brazil, specially from the defensive line. Against a stronger side, Brazil will have serious difficulties in keeping the ball out of their penalty area. Croatia did what i expected them to do, defend and try to keep the game close. They were betrayed by a shaky goalkeeper that could and should have done better in the first and third goal. If Croatia plays the next game like they did the first 20 minutes of the second half, they will be a very difficult team to beat. Mandzukic will be back from suspension and hopefully their goalkeeper rebounds back from two goals in which he can take some of the blame for. These were the staff picks for this game. We all had Brazil winning today but nobody guessed the correct result. The closest would have been Iain and Pedro, only off by 1 goal.